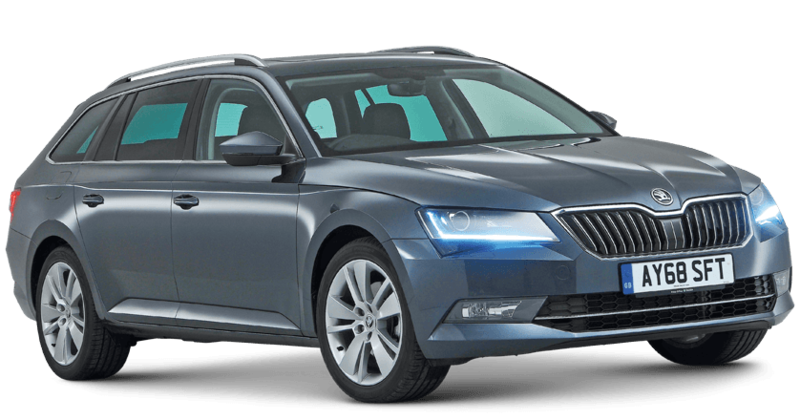 Skoda Superb Estate Performance, Engine, Ride, Handling | What Car? The 148bhp 1.5-litre petrol is gutsy enough to cope with a car of this size. However, the 148bhp 2.0-litre diesel is better still, because you don't have to work it so hard to make brisk progress. It’s quicker than the equivalent Ford Mondeo, and we don't reckon it's worth paying the extra for the even gutsier 187bhp diesel. Completing the range is a 276bhp 2.0-litre petrol that's only available with the automatic gearbox and four-wheel drive. It is by far the most powerful engine in the lineup and delivers fantastic pace that rivals even a BMW 3 Series 330i Touring, but it's rather expensive. If you particularly want petrol power, we find the 1.5-litre easier to recommend. On standard suspension and small wheels, the Superb Estate is very comfortable, even when compared with the smooth-riding Ford Mondeo Estate. Around town, it deals admirably with patchy surfaces and large speed bumps and feels settled on a motorway cruise. The only compromise is an occasional and slightly unpleasant floating sensation on undulating roads. Adaptive suspension is standard on the top-of-the-range Laurin & Klement trim and optional on everything else apart from the entry-level S version. The system enables you to choose between various modes, ranging from Comfort to Sport. In the softest Comfort setting, the Superb Estate wafts along, soaking up all but the sharpest of bumps but, as with the standard set-up, the trade-off is a fair amount of vertical movement over crests. Selecting Sport tightens everything up, but makes things a lot bumpier over imperfect roads. We wouldn't bother adding adaptive dampers if it's a more comfortable ride that you're after. Sportline models, meanwhile, have a ‘sport chassis’ that has stiffer suspension than the standard models. The result is a slightly firmer ride that, while not uncomfortable, doesn’t iron out road imperfections quite as effectively as the other suspension options. Whichever suspension set-up you choose, it’s worth avoiding the 19in wheels. They make the ride more fidgety and prone to thumping over large intrusions. This is especially pronounced on the four-wheel-drive versions. The Superb Estate offers safe, secure and predictable handling. Regular front-wheel drive versions have plenty of grip; four-wheel-drive models offer added traction and more assured control in slippery conditions. 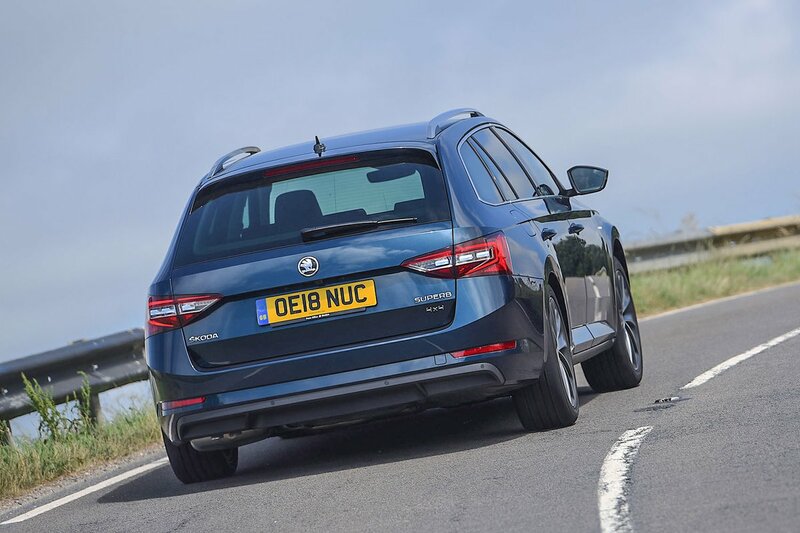 Although the steering offers little genuine feedback, it is at least precise and well weighted, making it easy to place the Superb Estate where you want it in corners and helping you to stay within your lane on the motorway. Opt for a Sportline Plus model and you’ll get ‘progressive dynamic steering’, which is designed to make the car more stable at high speeds and more manoeuvrable at low speeds. The system achieves this by increasing the sensitivity of steering inputs at low speeds, while decreasing them at high speeds; in truth, you’ll hardly notice the difference in everyday driving. The brakes on all models are strong, with enough feel through the pedal to make the Superb easy to drive smoothly and with confidence. However, while undoubtedly safe, secure and reassuring, it all feels a little dull – even in racy-looking Sportline models with sports suspension. If you prefer a more exciting drive, you’ll probably find the Ford Mondeo more to your taste. At speed, you get a flutter of wind noise from around the Superb Estate’s windscreen and mirrors. The larger wheels also cause some road noise, accompanied by tyre slap over motorway expansion joints. There’s some noise from the suspension as well, especially in Sportline models. These flaws could equally be levelled at any of the Superb’s chief rivals and don’t prevent the car from being a relaxed cruiser. 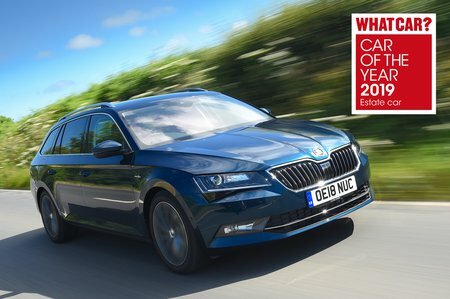 However, if you’re cross shopping a high-end Superb against a premium rival such as the Audi A4 Avant or Volvo V60, it’s worth noting that both are quieter than the Skoda. The diesel engines – particularly the 187bhp version – are noisy from cold and slightly gruff under hard acceleration, but they settle into a distant hum at cruising speeds. All the petrol engines are smooth and quiet. The manual gearbox has a slick shift and a positive clutch action that makes it easy to drive smoothly around town. The dual-clutch automatic gearbox, on the other hand, can be jerky in stop-start traffic, but on the open road it changes up and down through its ratios seamlessly.